The supreme tragedy is still not seen that in Germany it was largely people of good will, men who were admired and held up as models in democratic countries, who prepared the way for, if they did not actually create, the forces which now stand for every thing they detest. .... Few are ready to recognize that the rise of fascism and naziism was not a reaction against the socialist trends of the preceding period but a necessary outcome of those tendencies. This is a truth which most people were unwilling to see even when the similarities of many of the repellent features of the internal regimes in communist Russia and National Socialist Germany were widely recognized. As a result, many who think themselves infinitely superior to the aberrations of naziism, and sincerely hate all its manifestations, work at the same time for ideals whose realization would lead straight to the abhorred tyranny. ...the socialism of which we speak is not a party matter, and the questions which we are discussing have little to do with the questions at dispute between political parties. It does not affect our problem that some groups may want less socialism than others; that some want socialism mainly in the interest of one group and others in that of another. The important point is that, if we take the people whose views influence developments, they are now in the democracies in some measure all socialists. 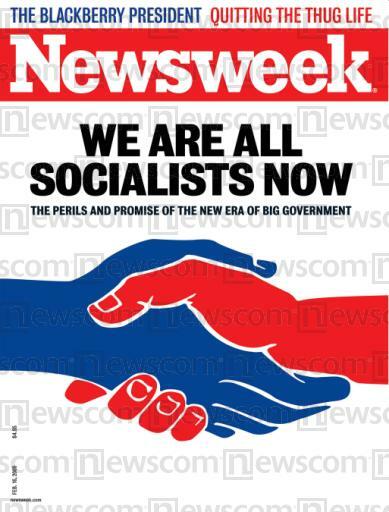 If it is no longer fashionable to emphasize that "we are all socialists now," this is so merely because the fact is too obvious.